They were unlikely leaders. Most knew more about mending nets than winning converts when Jesus said he would make them ‘fishers of men.’ Yet 2,000 years later, all over the world, the apostles are still drawing people in. It seems popular today to denigrate and belittle Christians and their faith. However Christianity has literally shaped Western society and the way we perceive the world. It has been the major guiding force and philosophy in society and is still changing and influencing lives, governments and countries today. But how did a religion borne in an obscure backwater of the Roman Empire with its optimistic and tolerant message, suffering severe Roman persecution and oppression spread to become the most dominant religion in the world? Apart from the apostle Paul and some activities of Peter, the new testament does not explicitly record exactly which or where the apostles travelled to spread the Christian message. All but a few of the 12 apostles died natural deaths. The majority were persecuted and executed for their faith. Clearly something phenomenal was going on with these simple men after Jesus’ death and resurrection. Claims that the death and resurrection were faked by his apostles clearly belie the actions of these men and their willingness to suffer and die for their cause. No single man, let alone 12, will gladly suffer for what he knows to be untrue or fallacious. In this article we look at how these remarkable men spread the Christian message so that within 35 years of Jesus’ death it had become an Empire wide religion to the extent that the Emperor felt threatened enough to actively promote state persecution of Christians. In the first years after the Crucifixion, Christianity was only the seed of a new religion, lacking a developed liturgy, a method of worship, and a name-the earliest followers called it simply “the way.” It was not even a formal sect of Judaism. Peter was the movement’s first champion; in the Acts of the Apostles we hear of his mass conversions and miraclemaking-healing the lame, raising the dead-and in an un-Christian flourish, calling down a supernatural death upon one couple who held back a portion of their donation to the community. In its earliest days the movement was too insignificant to attract wide-scale persecution, and Christians, as they came to be called, had more friction with neighbouring Jewish sects than with the Roman Empire. He also predicted the destruction of the Temple in Jerusalem, which would take place in A.D. 70 by the Roman army. When persecution did break out it was in Jerusalem at which time the new believers in the “way” became scattered. This undoubtedly helped to propel the religion out across the Empire. However this event was not enough in itself to ensure that the fledgling Christianity would become a world wide religion. The apostles were clearly on fire with something. They were the movements cutting edge, spreading the message across the vast trade network of the ancient world and leaving small Christian communities in their paths. This was the big bang moment for Christianity, with the Apostles blasting out of Jerusalem and scattering across the known world. In the year 110 Ignatius, the bishop of Antioch, was arrested by the Romans under Trajan, shipped to Rome, and condemned to death ad bestias-by beasts-at the public games. Bloody episodes like this would recur sporadically for the next two centuries. Tradition holds that 11 of the Twelve Apostles were martyred. Peter, Andrew, and Philip were crucified; ]ames the Greater and Thaddaeus fell to the sword; James the Lesser was beaten to death while praying for his attackers; Bartholomew was flayed alive and then crucified; Thomas and Matthew were speared; Matthias was stoned to death; and Simon was either crucified or sawed in half. John the last survivor of the Twelve likely died peaceably, possibly in Ephesus, around the year 100. Thomas the Apostle went east, through what is now Syria and Iran and, historians believe, on down to southern India. He travelled farther than even the indefatigable Paul, whose journeys encompassed much of the Mediterranean. Of all the Apostles, Thomas represents most profoundly the missionary zeal associated with the rise of Christianity-the drive to travel to the ends of the known world to preach a new creed. Mark the Evangelist too spread the word, bringing Christ’s message to Egypt and founding the Coptic faith. But for some Catholics, Mark represents most emphatically the saint as political symbol, powerfully linked with the identity of Venice. Even today he retains a strong grip on the consciousness of modern-day Venetians. Jesus gave some disciples a second name; Simon the fisherman was also Peter, the “rock.” He was the first to invite non-Jews to join the early church. Persuaded by John the Baptist, Andrew and his brother Peter became Jesus’ first followers. Andrew later preached in Greece and perhaps Ukraine. He was a fisherman with his brother, John, and was beheaded in Jerusalem. Some believe that he preached in Spain and was buried there. John and his brother, James, “sons of Zebedee,” were in Jesus’ inner circle. The fourth Gospel, three epistles, and the Book of Revelation are attributed to John. Like nearly all of the Apostles, Philip hailed from Galilee, the region in northern Israel where Jesus’ ministry was centred. He may have been martyred in Hierapolis. Some believe he was Nathanael, who questioned the Messiah’s small-town origin: “Can anything good come out of Nazareth?” He may have gone to Turkey, India, or Armenia. Though doubting Thomas needed to touch Jesus’ wounds to be convinced of the resurrection, he became a fervent missionary who is said to have proselytized in India. Jesus shocked Jewish society by dining with Levi, whose job as a tax collector had made him an outcast. As an Apostle, Levi was called Matthew and wrote the first Gospel. The Bible reveals little about this James—only that he was a “son of Alphaeus.” Most scholars think a different James wrote the biblical epistle of that name. Several stories connect Thaddaeus, known also as Lebbaeus or Jude, to Persia. According to Eastern tradition, he converted the city of Edessa after healing its king. The Bible calls him Simon the Zealot, perhaps a reference to his political affiliation. Later accounts depict him as a missionary to Persia, where he was martyred. Mary, from Magdala, followed Jesus after he cured her of “seven demons.” She stayed near him during the Crucifixion and was the first to see him after his resurrection. Also called John, he was mentored by Peter—his likely source for writing the second Gospel—and traveled with Paul to Antioch. Mark founded the Church of Alexandria. 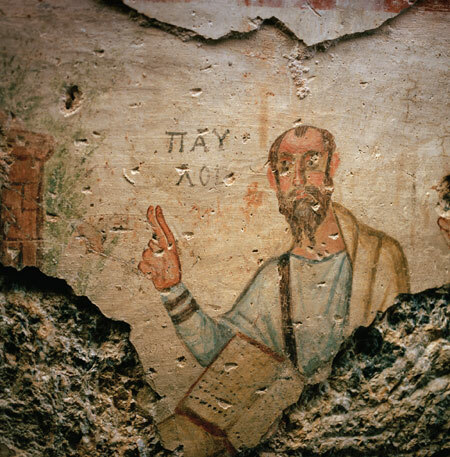 A gentile physician from Antioch who joined Paul’s missions, Luke chronicled the development of the early church in the third Gospel and the Acts of the Apostles. A vision transformed Saul, a persecutor of the early Christians, into Paul. His missionary journeys helped spread Christianity throughout the Mediterranean.